Hi, I'm totally new at styling my hair but I think I'm getting closer to getting the hang of it. I love this community, all of you ladies look so gorgeous! I took pictures of my attempt because I've had trouble finding many tutorials so I thought we could always use one more :) This is my first post so I hope I did everything right. If there are too many pictures just let me know! 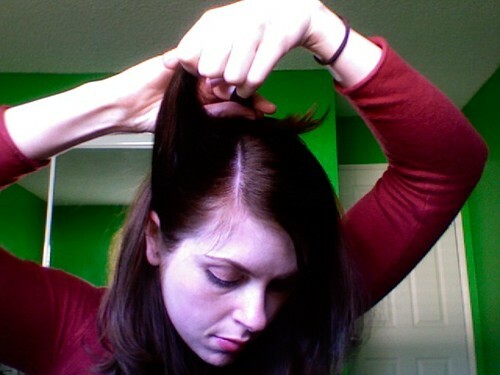 Section off the hair from your hairline to right behind your ear. You want a big enough section so that your roll won't be see through. Those with thinner hair might have to backcomb a little. 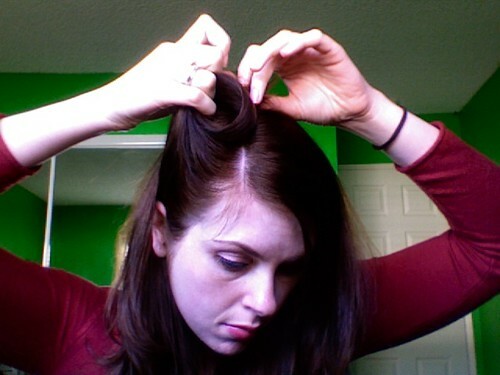 Pull the hair up vertically and start forming a loop. 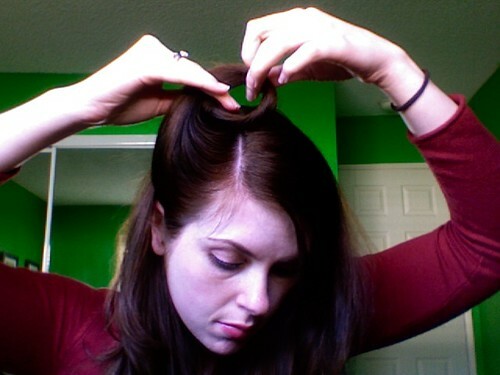 Hold on to the top part of the loop with one hand and start rolling the ends in a circle inside the loop. 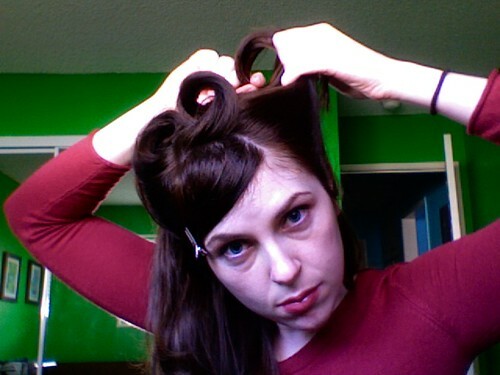 Basically coil the hair into a roll from the outside in. I do this from the back of the loop rather than the side closer to my face so the ends won't stick out the front when you finish the roll. When you have a nice roll you can adjust the placement a little by rolling it in on itself to make it tighter. 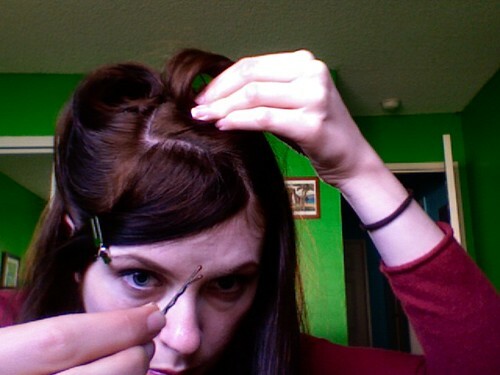 Place one bobby pin through the very bottom of the roll in the front, and one in the back. I like to do three rolls because my hair is pretty thick so I make about a 2 inch section in the middle (on the other ride of my part) and roll it facing the opposite direction of the first roll. Use the same process as the first roll, just go in the opposite direction. Pin and hairspray as needed. 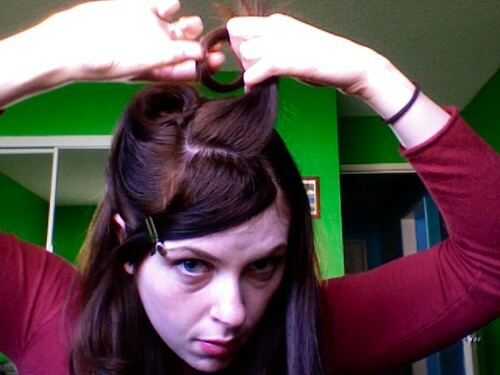 Grab the hair from the other side and section it off right behind the ear like the first roll. Try to make it about the same amount of hair as the first roll. Roll it in the same way as the other rolls, like a coil from the outside in. Make sure that the side near your ear doesn't get too droopy. If it starts to droop a little try a light hair spray and push it in to hold it up. 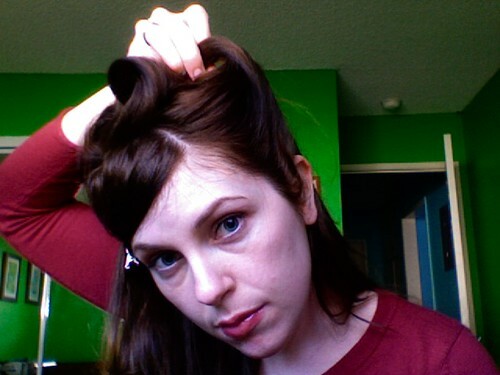 I have side swept bangs that reach about the rip of my nose, so I just made a little roll for them to go into. 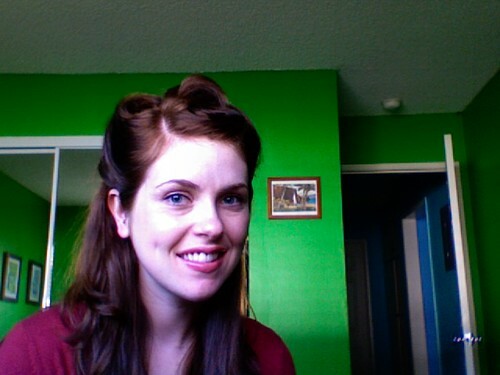 It's more like a regular pin curl. If I was going out I probably use a lot more hairspray. 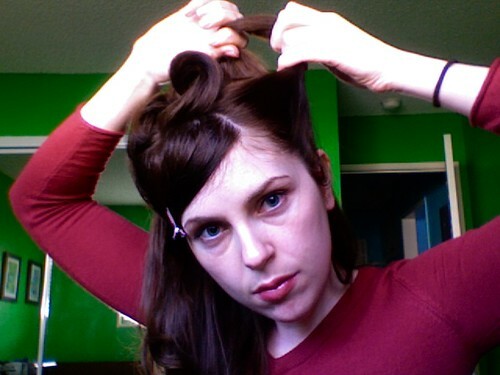 I would also curl the remaining hair. I love the pictures! You are so pretty! Great job! I love that wall color, let's get that out of the way. Now, this is a good tut, could you put some tags on it? So it can be found easily? p.s. Have I seen you on the FL? I think I have... either that or I am the crazy poodle lady. I agree about the wall color - it's lovely! THat is the wall color that wakes me up in the morning and says "you need a Gin and Tonic." I was thinking more along the lines of a mojito (yum), but yes - something nice to wake up to. Ahhh.. so I am not going crazy. So you just started a journal? That is great! 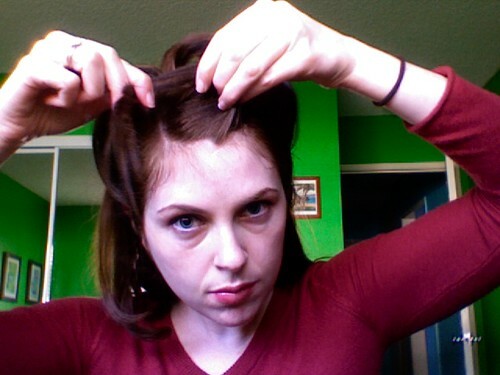 Welcome to vintagehair and LiveJournal. Why yes you have! I commented on your last hair post :) I'm AudreyHorne (it was taken on here). My first thought about those pics was "WOWZA - I want those walls!" I'm glad everyone likes the walls, they are pretty bright. We painted everything bright blues and greens. your hair looks great hun! I've done three rolls a couple of times before, this post has inspired me to do it again! You're beautiful! 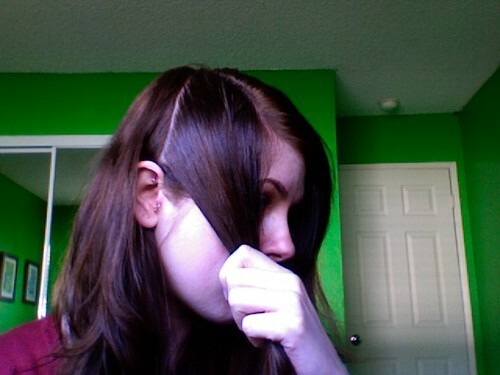 That looks great and my hair's just like yours, so I am totally memorying this. thanks for this! I JUST found this community! I am so excited. Plus this post couldn't come with better timing! I have the perfect outfit and I need 40's hair! THANK YOU!